The coalition coordination committee, headed by ex-CM Siddaramaiah, which met here on Wednesday, decided to fill all the vacant berths in one go. 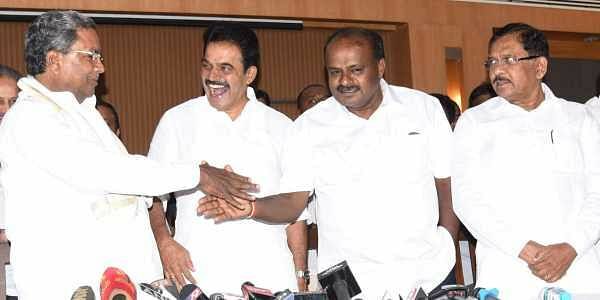 BENGALURU: Determined to end the dissidence within and foil any attempts by the BJP to destabilise the government, the coalition partners Congress and JD(S) have decided to complete the much-delayed cabinet expansion by filling all the eight vacant slots on December 22. Congress has six while JD(S) has two vacancies from their quotas. The coalition coordination committee, headed by ex-CM Siddaramaiah, which met here on Wednesday, decided to fill all the vacant berths in one go. It also decided to appoint heads for 30 boards and corporations and appoint a few MLAs as Parliamentary Secretaries. Speaking to reporters, Siddaramaiah said appointments will be made to 30 boards and corporations in the first phase with Congress getting 20 and JD(S) 10 under the 2:1 power-sharing formula. As for appointments of Parliamentary Secretaries, Congress will get six and JD(S) three. The Parliamentary Secretaries and heads of boards and corporations are expected to get the status of minister of state. All these appointments will be done the same day, a day after the conclusion of the winter session of the legislature.“We had earlier planned to expand the cabinet on December 9, but were forced to have it after the session as the coalition partners will be busy in preparing for the session over the next few days,” Siddaramaiah said. The decision comes in the face of threats of poaching of Congress MLAs by BJP to bring down the government. Almost all the vacant posts will be given to sulking MLAs as part of efforts to pacify them. According to Danish Ali, JD(S) national secretary general and member of the coordination committee, the date for cabinet expansion and appointment of MLAs to boards and corporations was finalised only after consulting AICC president Rahul Gandhi and JD(S) supremo H D Deve Gowda over phone. “So there is no question of any changes in the date of cabinet expansion,”he said. Siddaramaiah and JD(S) national secretary general Danish Ali ridiculed Union minister Prakash Javadekar’s prediction of a political earthquake in Karnataka in December as a “daydream”. “BJP will feel the tremors of the quake on December 11 when the results of the assembly election in five states will be out and BJP will lose in all those states,” Ali said. “Javadekar is making these statements on hearsay. He is predicting a political earthquake, but in which country?” Siddaramaiah asked. “BJP leaders are daydreaming about bringing down this government with Operation Lotus. But they will not succeed. This government will complete its five-year term. BJP will lose in all five states where assembly elections are being held,” Siddaramaiah said.